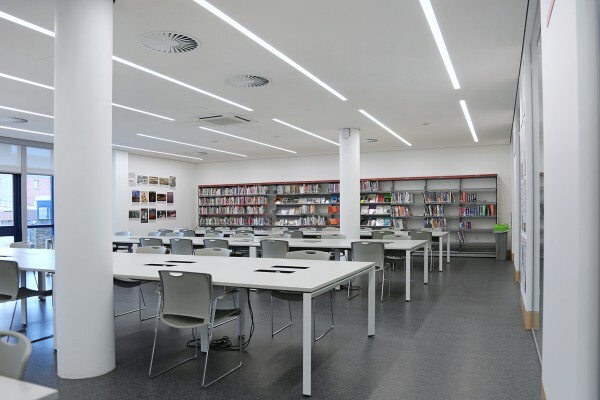 Libraries are noted for their quiet acoustics, and nowhere is this more true than a prominent London library which has just been refurbished with products supplied by Sto Ltd. Transforming the existing building into a new integrated Library and Customer Service Centre involved the removal of many internal walls to create larger, flexible open plan areas. These included various spaces which could be adapted for different uses, and this made the installation of effective and reliable acoustic design and balance a major priority. “The 25mm StoSilent Distance system also allowed us to accommodate lighting and other fittings, and yet still create the type of monolithic, seamless finishes which were required to give the library a clean and modern appearance,” adds Tony Partridge of suspended ceiling specialists Roskel Contracts Ltd who completed the installation work, and are an authorized acoustic installer for Sto UK. “It is well suited to refurbishment projects such as this, where plenums behind the ceilings are also often being used for ventilation duties. It allows for the creation of effective sound-absorbent ceilings in situations where they have to be suspended to accommodate existing services or reduce room height.” In this situation, StoSilent Distance is able to accommodate the air movement systems above the ceilings without suffering from the discolouration and staining found on other systems. The StoSilent Distance system can be installed as a suspended ceiling or as a wall covering over a cavity, and areas of up to 200m² can be created without the need for a break in the system, as well as curves down to a radius of 5m. This allows an effective acoustic solution to be created for many different types of installation. The system features a metal profile sub-structure fitted with acoustic panels manufactured from expanded glass granulate. The lightweight system is easy to cut and work with, and it can be adjusted to suit any room shape while still creating a uniform, seamless surface. Impressive inclined planes and curves of all types can be created, without any worry of cracks appearing in the future. For the Marcus Garvey Centre, the StoSilent Distance installation was completed with Sto’s Décor M finish. This environmentally-friendly, spray-applied finish can be tinted to match a wide range of shades from the StoColor system, allowing the finished acoustic solution to form an integral part of an interior decoration scheme.